You, Me and Movies: Today's Behind the Scenes Pic of the Day says "Nice Night For A Walk!" Today's Behind the Scenes Pic of the Day says "Nice Night For A Walk!" I may not agree with James Cameron and his views toward superhero movies, but man does the guy have a vigorous imagination. James is responsible for some great movies. "Avatar," and "Titantic" (yes, I said it, sue me) and of course "The Terminator" movies. As far as I'm concerned, the Terminator movies with Cameron's name on them are the only ones that matter. I wish he would have kept up with the franchise. I'm not sure what's going on in this picture, but I can only imagine that the dialogue back and forth between Schwarzenegger and Cameron was one for the books. You can tell by Schwarzenegger's hairdo that it was taken during the making of T2. 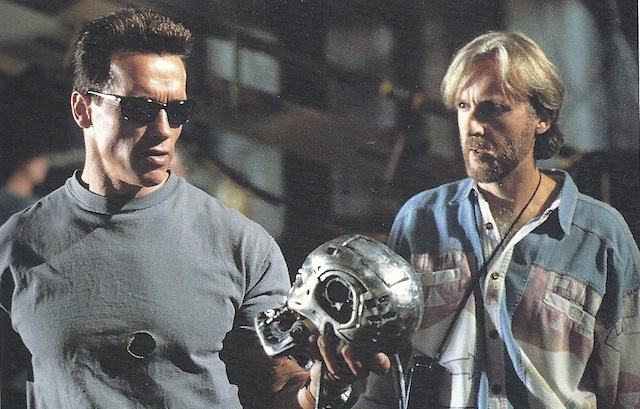 From the looks of the photo though, I imagine Schwarzenegger was giving Cameron his ideas for the future of the franchise and Cameron was scared to death of his ideas!